Day 5 is a 45 minute scripted thriller television series, which kicked off on June 19, 2016, on Rooster Teeth and is broadcast every Sunday at . The show is currently in its 2nd season. and just maybe find a way to sleep again. 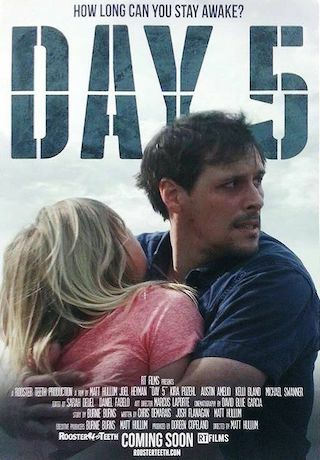 Set in a world of insomniacs, late-shift workers and roving psychotics, Day 5 presents a unique vision of the apocalypse that fuses serial drama and thriller around a human story of survival and redemption.